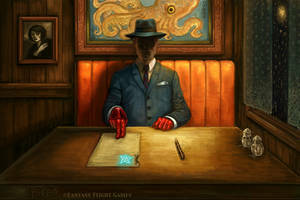 So this was done for a Lovecraftian RPG? I may need to find this book and read up on the system. It looks amazing. I love this so much! It's so cool! Every time I look at it I find something creepy and new! This is really well done too! Great job! Love it so much! Came from Tumblr and I'm glad to see it's original source UvU love the rest of your gallery too! How can I purchase a print of the blue plate special and the grand international hotel? Deviantart sells them, and if you sign up for a free account you will get access to their print center, with lots off paper and size options. If you want, I sell signed, poster-sized (24" x 24") prints of both. Drop me a note here or get me an email address and we can see what they will cost based on where you live. My e-mail is jared.schmook@gmail.com. I am interested in the signed print prices. Thank you! This is fantastic. You've probably already heard that there is a ripped off version on tumblr and as sad and annoying that is, I am having SO MUCH FUN trying to find all the creepy things with others! Absolutely amazing work! I'm interested in purchasing this painting plus The Grand International Hotel. How do I go about doing so? Thank you for your time! Deviantart sells them, and if you sign up for a free account you will get access to their print center, with lots off paper and size options. If you want, I sell signed, poster-sized (24" x 24") prints of both. Drop me a note here or get me an email address and we can see what they will cost shipped based on where you live. And thank you so much for liking it! I see some people share this picture on other social media, I'm glad I could see you the owner of this art. I wanted to ask how many oddities there are in this piece, I count 11/12? And then 14 in the second piece you did similar to this one. How far off the mark am I? F*ck! I'm missing one or two in the first image. You are just about right! Can it be, the source of the oft-seen artwork? It is one of my favourite pieces to date. That is a very nice thing to hear, thanks! Amazing work! I love how, at first glance, everything looks completely normal, except for that skull in the cup... and wait, the blind man is reading newspaper... IS THAT AN EYE ON HIS PLATE?! And it becomes a wild hunt to search for every small creepy detail hidden in the picture. It's both wonderful art and a great game! Thank you! What's that sticking to the woman's knife(? ), a filling that happens to be very sticky?. Oh and a bloody hand on the restroom door. And an octopus peeping out from underneath the counter. Why are there fingers and an eyeball on the newspaper man's plate?!? What's happening to the other man's face in the background? Nice! I love it. I actually wrote a short Comedy/Horror script that is about 15 pages that I'm calling "Dead Meat Diner" and want to shoot this summer. The blind man ... errr, gentleman, in this piece looks a lot like a character I have in the script. Keep up the great work, you have a new fan of your work in me. I hope i get a chance to see your short some time. Thanks for posting your very nice comment! I will definitely keep you updated. Take care and keep it up! Saw this uncredited on tumblr. Such a masterpiece! The more I look the more I find. Hi there! I love this! I now have poster sized (24" x 24") signed prints available for anyone who wants one. Great quality and reasonable prices Just drop me a note! Oh stop, I am blushing! You probably already know this, but someone on the hellscape known as tumblr stole this. A number of tumblr users did. I found this page after a user reblogged it showing it was stolen. So many easter eggs.. I love it!